MAKATI CITY, Philippines - Sta. Teresita Parish organized a Medical and Dental mission on June 12, 2018, a month before the closing of its 25th year Foundation Anniversary. The Catholic Women’s League in coordination with their Parish Priest, Rev. Fr. Richard J. Magararu, SMM and Parochial Vicar, Rev. Fr. Angelito Pusikit, SMM organized the free medical service event. Despite unfavourable weather during that day, the turn out of the parishioners was overwhelming. Medicines which were prescribed by the doctors were given to all the patients for free. 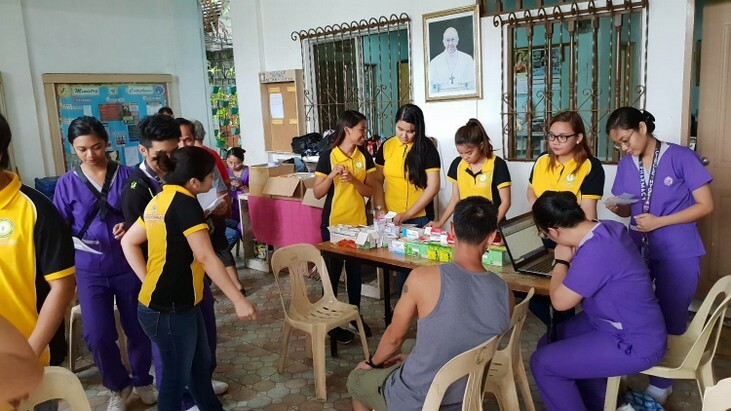 Present also were medical doctors, dentists, pharmacists, nurses and students from the College of Allied Health and Studies of the University of Makati who offered their services voluntarily. The youth of the parish were responsible for the registration while others served as ushers/usherettes. The success of the mission was the fruit of another collaborative effort of all ministries and organizations in the parish. The mission is intended to give free health services to all the parishioners such as foot screening, tooth extraction, medical and dental check-up, etc. Congratulations for a successful Medical-Dental Mission in Sta Teresita Parish! I hope it was also an occasion to attract and recruit followers of the Totus Tuus Journey of St. Louis Marie de Montfort. If only we can recruit many more, then the blessings and the gifts from praying, especially adding the prayers of Montfort to our Rosary prayers, can reach more - not just TTJers but also their families. When my parents learned that I became a TTJer, they recalled that in their time - as high school and college students up to their working years - they had a devotion to the Holy Rosary, and prayers of St.Louis Marie de Montfort were prayed - and those prayers were attributed to him even then!